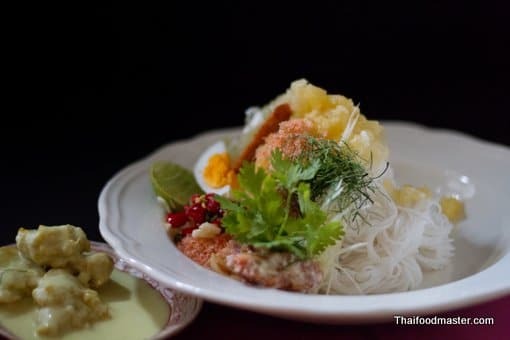 Khanohm jeen saao naam is a dish of Fermented rice noodles served with pineapple, fish balls in coconut milk, grilled curried fish cakes, young ginger, dry shrimp powder and more….. Although the weather in Thailand is relatively hot throughout the year, the months between March and June are called summer. And there is no escape from the Thai summer: It swathes you in a humid heat blanket. These days, however, you can find refuge on picture-perfect tropical beaches, or hide in modern, comfortable air-conditioned buildings. 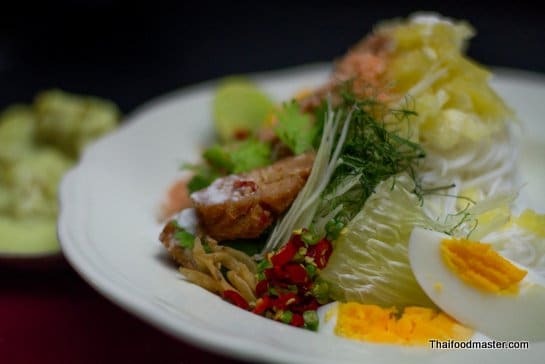 But back in the old days, when air-conditioning and ice cream were not available, Thai conventional wisdom prescribed summer dishes that refreshed with predominantly sour and sweet flavors, and naturally chilled things up via the stomach. Dtohm sohm (ต้มส้ม) – a sour soup made mostly with fish. Laawy gaaeo (ลอยแก้ว) – a dessert of sour fruit in sweet syrup. Bplaa haaeng dtaaeng mo:h (ปลาแห้งแตงโม) – dry fish relish served with watermelon. Khaao chaae (ข้าวแช่) Rice soaked in cold jasmine-scented water and served with a range of condiments and side dishes, including stuffed shallots, seasoned fermented shrimp paste balls, stuffed banana peppers, shredded sweet fish, beef and pork, just to mention a few. 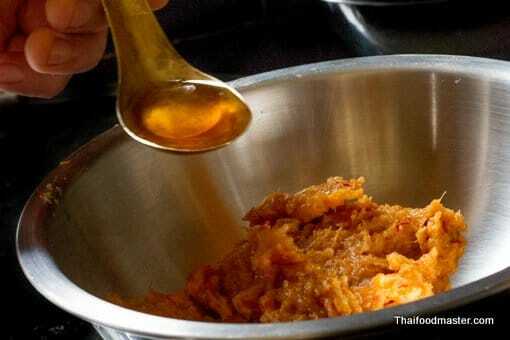 And finally, the dish we will prepare today: khanohm jeen saao naam (ขนมจีนซาวน้ำ). 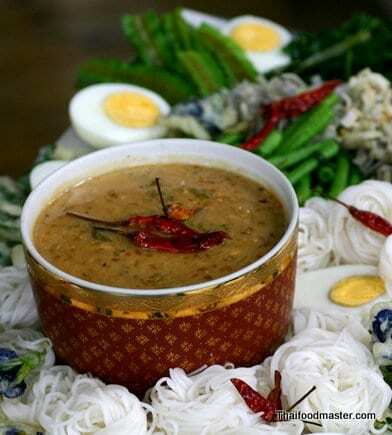 Khanohm jeen saao naam is a fairly simple dish to prepare but it can get as detailed and sophisticated as your time and skills, as well as the ingredients available to you, permit. The basic version consists of fermented rice noodles (khanohm jeen), which are served with sweet and sour pineapple, pounded fluffy dry shrimp powder, young ginger, sliced garlic and bird’s eye chilies, and seasoned with sugar, fish sauce and lime according to taste. 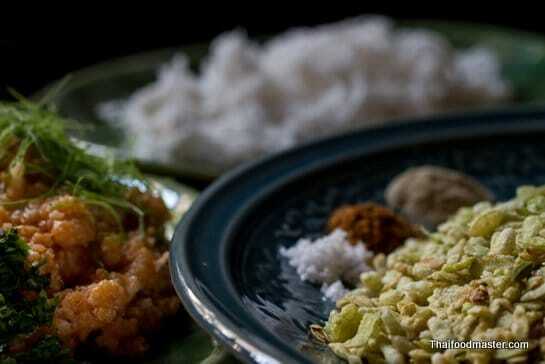 It is usually served with a side dish of jaaeng laawn (แจงลอน), freshwater fish balls cooked in coconut cream. The resulting dish is a harmonious orchestra of colors, textures and flavors – all coming together beautifully. This is a dish celebrated for its cooling, refreshing and satiating qualities. 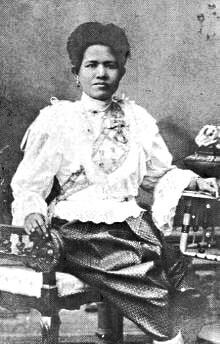 In addition to using pineapple as the featured fruit, Lady Gleep suggests sweet-sour fruit varieties such as pomelo, salacca (ragam – ระกำ) and green mandarin orange (sohm men – ส้มเหม็น). In her recipe Lady Gleep uses Snakehead fish but we preferred using Clown Featherback (bplaa graai – ปลากราย): The meat of this freshwater fish has a wonderful consistency suitable for making fish balls. Its texture should be developed by intense pounding and kneading, all while maintaining a cold temperature; please do not use a food processor, as it generates unwanted heat that will spoil the texture of the final product. Start by scraping the flesh of the fish with a spoon. Keep the meat chilled, to prevent the fat from disintegrating and ruining the texture. 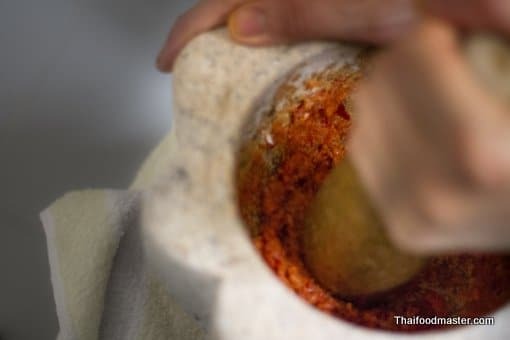 The fish meat must be pounded with a pestle in a mortar for quite a long time with pure muscle force – pound it until it thickens and becomes gooey and sticky. You will know you are there when the meat becomes so sticky that you cannot easily lift the pestle. 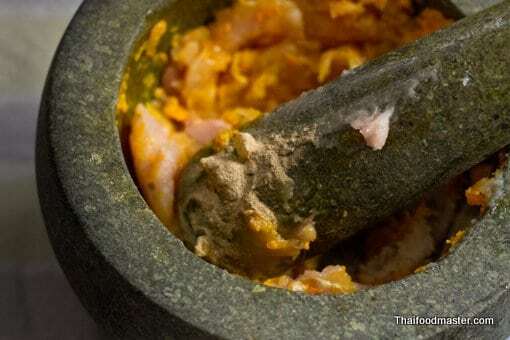 Use concentrated salt water to rub the pestle from time to time, as this prevents the fish meat from sticking to the pestle and also introduces some saltiness to the meat. Also, keep the pestle cold. You can freeze it before you start working, or soak it in iced water at intervals. 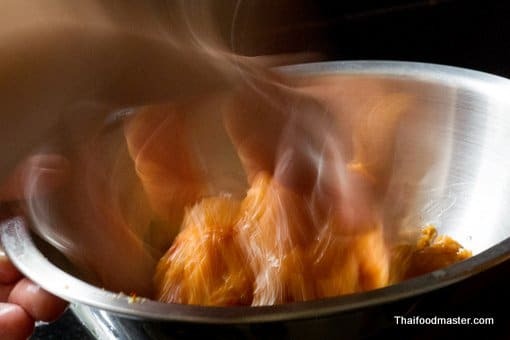 To improve the fish meat texture even further, after pounding it, knead it vigorously, shape it into a ball and throw it forcefully into the pot from a height. To maintain cold temperatures during the process of working the fish meat, we recommend using two bowls – with one mixing bowl placed in a bigger bowl filled with ice. In commercial fish ball production, crushed ice is added to the meat and, in some cases, sodium bicarbonate; but we tend to avoid these mass production techniques, preferring to use the authentic, old culinary techniques that are rarely applied nowadays. 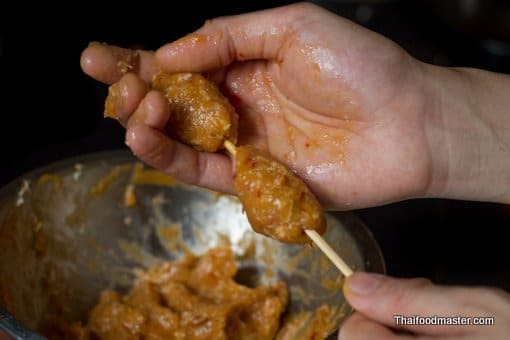 Once the fish paste becomes sufficiently gooey and sticky, roll it into balls and cook them in under-boiling temperatures of around 80c (176F). The balls will float when they are fully cooked. However, today, for our khanohm jeen saao naam, we won’t make round fish balls, but will shape them into a flat, not-too-thin fish cake. 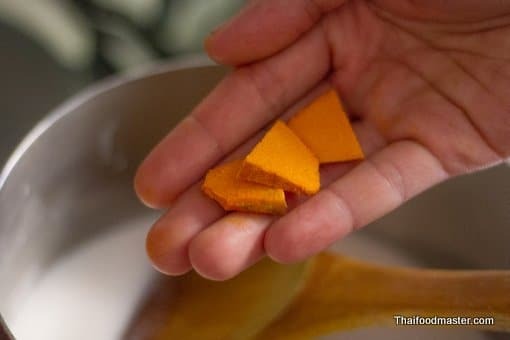 We will also use fresh turmeric-tinted coconut milk seasoned with a pinch of salt to cook them. The final product is known as jaaeng laawn (แจงลอน). To make the grilled curried fish cakes, we will first prepare the curry paste from dry chilies, lemongrass, galangal, coriander root, shallots and garlic. 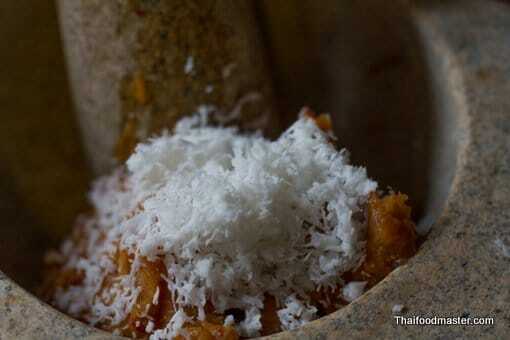 We will incorporate grated coconut into the meat and season it simply with fish sauce. 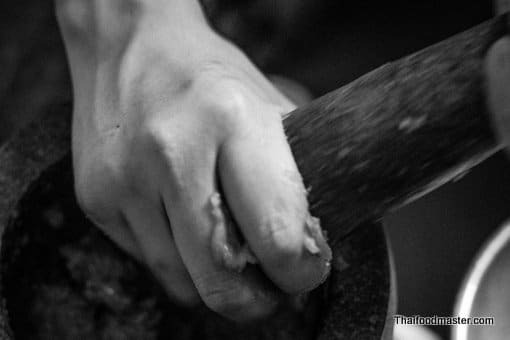 The fish meat will again undergo the arduous process of pounding and kneading before we shape it into oval cakes and place on skewers. We will then grill the fish cakes over low heat, periodically brushing them with coconut cream to create a shiny glaze and retain the moisture. You can serve this dish on individual plates or buffet-style, where each guest selects side dishes to add over the noodles. 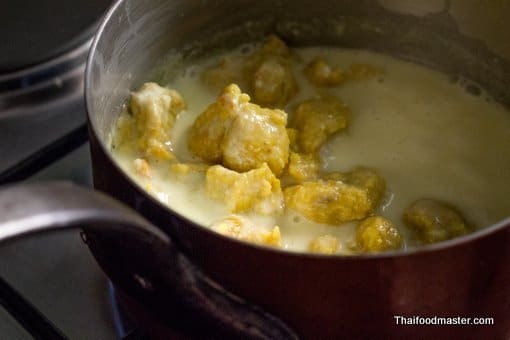 Fish balls in coconut cream (jaaeng laawn – แจงลอน). 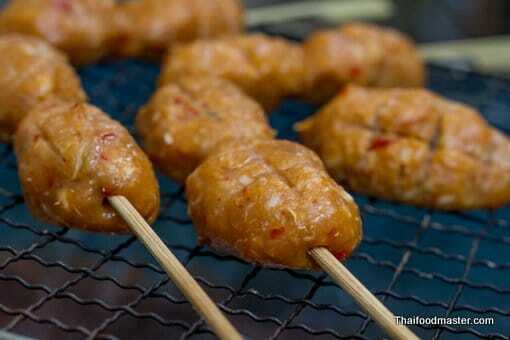 Grilled curried fish cakes (jaaeng laawn bping – แจงลอนปิ้ง). Chopped and sliced sweet and sour fruits: pineapple, pomelo and salacca. Fresh, julienned long red peppers. Julienned, hair-thin coriander leaves and kaffir lime leaves. Sliced lime and green Mandarin orange. Nam bplaa phrik (fish sauce and bird’s eye chilies). 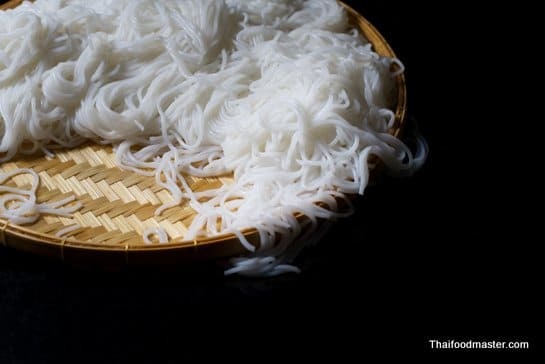 When you are ready to taste this delicious dish, just roll a bite-sized serving of fermented rice noodles onto your plate. On top of the noodles, place some pomelo, pineapple, ginger, a bit of garlic and chopped salacca. Sprinkle some dry shrimp powder, sugar, and squeeze some lime or green Mandarin orange juice, and don’t forget to add chilies and a piece from the fish cakes. What a heavenly bite! I will leave you now to enjoy it. Rice noodles (khanohm jeen), which are served with sweet and sour pineapple, pounded fluffy dry shrimp powder, young ginger, sliced garlic and bird’s eye chilies, and seasoned with sugar, fish sauce and lime according to taste. The resulting dish is a harmonious orchestra of colors, textures and flavors – all coming together beautifully. This is a dish celebrated for its cooling, refreshing and satiating qualities. Using a spoon, scrape the fish meat. 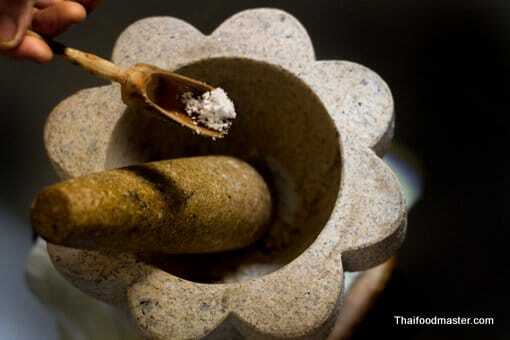 Add salt to a pestle and mortar. 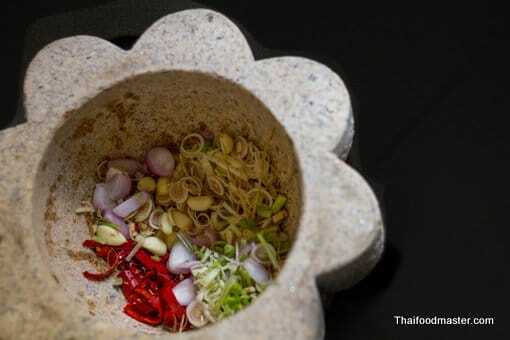 Add the curry ingredients, dry chilies soaked in water, chopped lemongrass, galangal, coriander root, garlic and shallots. Pound the ingredients into a smooth paste. 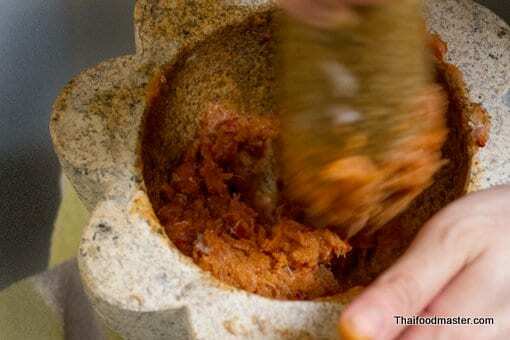 Pound the fish meat in a pestle and mortar. Wet your hand with a concentrated salt and water solution. Clean the fish off the pestle with your hand. Knead the fish meat mixture. Use two bowls, one filled with ice, to maintain cold temperatures. 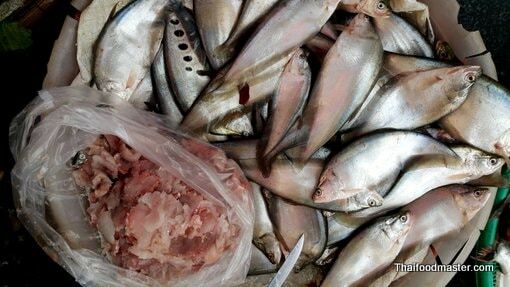 The fish meat is ready. On flat skewers, shape the fish meat into elongated balls. Charcoal grill over low heat, brushing the fish balls with coconut cream, until done. 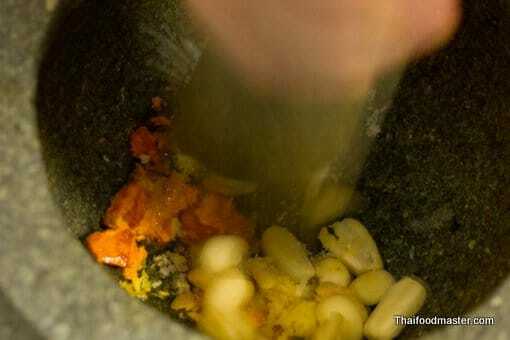 In a pestle and mortar, pound together into a fine paste the salt, garlic and fresh turmeric. Season with ground white peppercorns. 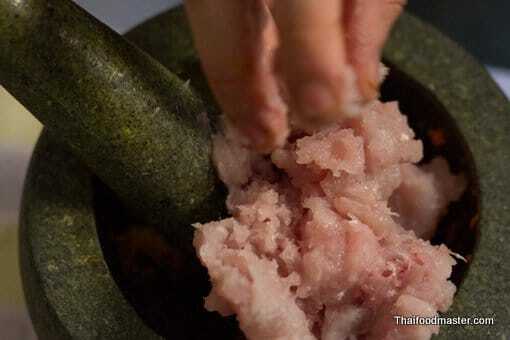 Wet your hand with a concentrated salt and water solution and clean the fish from the pestle with your hand. Place a pot with coconut cream over low heat, season with a pinch of salt. Add few slices of fresh turmeric. Shape the fish mixture into flat balls. Cook them in the simmering coconut cream until done. Serve and plate as described in the article. The sweet leading sour coconut cream based sauce, enriched and thickened with fragrant freshly roasted peanuts and golden beans are a wonderful coat to dress the sweet shrimp meat. The aromatics are being extracted in every possible way, by roasting, and frying, boiling and reducing, pounding and grounding. All the culinary methods are being fully employed to guarantee an absolute real first class dish. 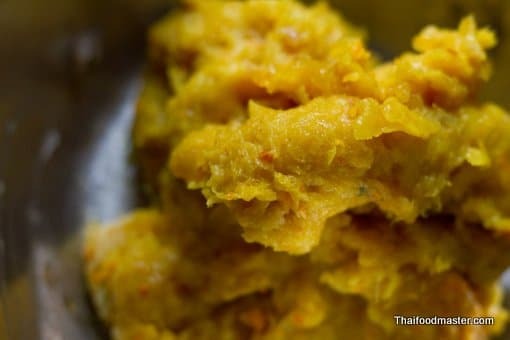 If you want to start some real Thai cooking going at your home, have the time and access to all the ingredients, than I really want you to try this dish. 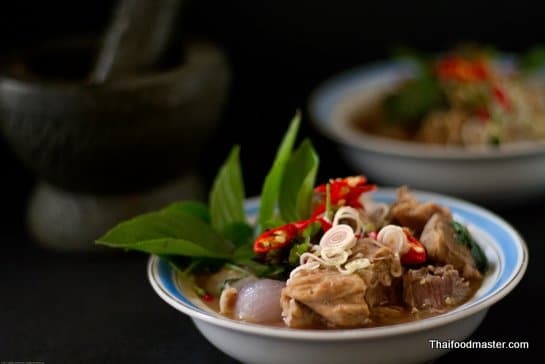 The building blocks of flavors work so well here and it will open you a great window to see the beginning of what is possible in Thai cuisine. Khanohm jeen (ขนมจีน) are noodles made from rice starch. Their strands are long, round, thin and elastic, with a beautiful white sheen and a pleasant chewy texture. It is unclear exactly when khanohm jeen production arrived in Thailand; however, it is likely that production was already active during the Ayutthaya period (1351-1767), in communities along the Khanohm Jeen canal, a main water artery in Ayutthaya’s Senna district (คลองขนมจีน อ.เสนา จ.พระนครศรีอยุธยา). 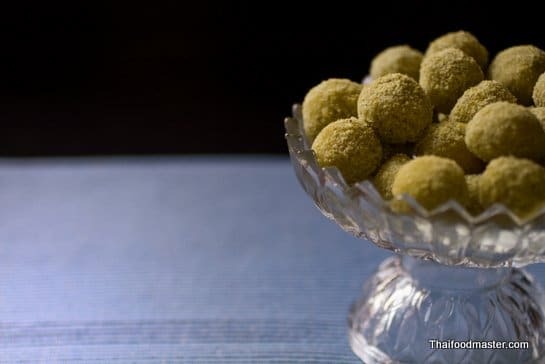 This ball-shaped dessert has a sweet coconut filling (gracheek), surrounded by a thin crust of pounded unripe rice crumbs, along with a tempting fragrance enriched with a Thai dessert candle or fresh flowers. Demonstrating brilliant creativity and attention to detail, this classical Thai dessert uses only three basic ingredients. 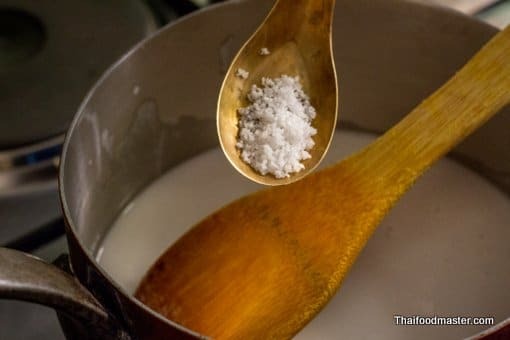 In this article, we have elected to follow the traditional recipe published in 1908 by Thanpuying Plean Passakornrawong.